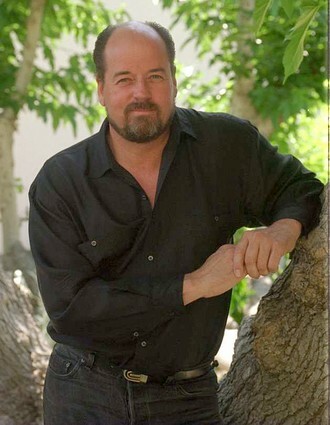 May 17th (Saturday) ~ at 2:00 p.m.
Tarzana, California, May 12, 2008 – Danton Burroughs, a family man, businessman, and collector of art, artifacts and literary works, and protector and promoter of the legacy of his Grandfather, Edgar Rice Burroughs (the author of Tarzan of the Apes and other famous American literary works), died at home in Tarzana, California on May 1, 2008. Danton passed away in his sleep due to heart failure. Danton had previously been diagnosed with Parkinson’s Disease. Throughout his younger years, Danton lived in a magical world created by the novels of his Grandfather which was filled with all the exciting illusions of exotic lands and inner earths that included heroes and villains larger than life. It was an exciting world that stimulated his imagination and Danton’s future was clearly set before him. Danton became an officer and director of the family owned business of Edgar Rice Burroughs, Inc. and was determined to keep his Grandfather’s legacy and fame alive. Danton’s engaging personality impressed all who knew him and his immense knowledge of the works and creations of his Grandfather allowed him to share his enthusiasm with business associates and friends. Danton was instrumental in the promotion and licensing of many diverse media properties, such as feature films, animated features, television series, daily and Sunday comic strips, live stage productions, theme park attractions, new editions of original novels and foreign editions, conventions, Burroughs Bibliophiles, fanzines, and comic books. Danton worked tirelessly, until the last day of his life, at Edgar Rice Burroughs, Inc., the company created by his Grandfather to market and promote his literary works and the characters he created like Tarzan Lord of the Jungle and John Carter of Mars. 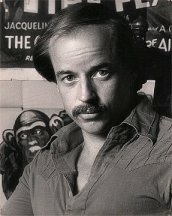 The company will continue to promote and foster the legacy of not only Edgar Rice Burroughs but also Danton through its President James Sullos and the members of the Burroughs Family who will honor Danton’s legacy by keeping his dream alive to share the wonderful and fantastical worlds and characters created by Edgar Rice Burroughs. Danton also sold real estate in the early 1970s in the San Fernando Valley and Venice, California. Danton’s personal passion was collecting art, artifacts, historical memorabilia and literary works. His vast and varied eclectic collections included Wurlitzer and Seeburg Jukeboxes, an extensive record collection, sheet music and artist's memorabilia of all sorts, bronze sculptures, rare pocket watches, marbles, street lamps, literary works and writings. The collections were amazing. Danton was a son of the San Fernando Valley. He was born on June 21, 1944 to John Coleman Burroughs and Jane Ralston Burroughs in Good Samaritan Hospital in Los Angeles, California. His Grandfather, Edgar Rice Burroughs, established the community of Tarzana with the renaming of the historic “Rancho del Cabrillo,” the “Tarzana Ranch,” consisting of 550 acres which he had purchased in 1919 from the Estate of General Harrison Gray Otis, the former publisher of the Los Angeles Times and Mirror Company. Gen. Otis was one of the 5 principal partners in the “Suburban Homes Company” who in 1909 had purchased the southerly 47,500 acres of the San Fernando Valley and recorded Tract 1000 in 1910. General Otis had purchased from the syndicate the first parcel of this Tract which Burroughs now owned. In 1927, the Tarzana Women’s Club asked Burroughs permission to use the Tarzana Ranch name which was later submitted with application for the establishment of the “Tarzana Post Office,” on December 16, 1930. Edgar Rice Burroughs, General Harrison Gray Otis, and William Mulholland, Chief Engineer of the City Water Department, who brought water into the San Fernando Valley via the Los Angeles Aqueduct, were the giants of that time who set the stage for the subdivision and development of the San Fernando Valley into the suburban communities it is today. 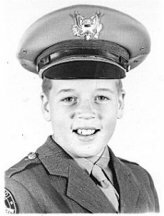 Danton grew up in Tarzana and attended Tarzana elementary school, Ridgewood Military Academy in Woodland Hills, Sequoia Jr. High School in Reseda, and Reseda High School. He attended Los Angeles Pierce College, he belonged to the Tri Chi Fraternity, and he graduated with a Bachelors of Arts Degree. Danton is survived by his wife Linda and daughters Jane and Dejah and brother John Ralston and sister Dian, who have vowed to continue to honor Danton’s legacy and that of his family by preserving and promoting the fantastical literary characters and creations of Edgar Rice Burroughs that so many Americans have enjoyed for almost a century. All who knew him, loved him. He was a dear husband, father, brother, and friend to all and our hearts are deeply saddened by his passing. In lieu of flowers the family suggests donations to the Danton Burroughs' Memorial Fund at Parkinson's Resource Organization, 74-090 El Paseo, Suite 102, Palm Desert, CA 92260 or through their website www.parkinsonsresource.org. Danton Burroughs, who spent his life marketing and protecting the work of his grandfather, Tarzan creator Edgar Rice Burroughs, died May 1 at his home in Tarzana, the San Fernando Valley community named after his ancestor's most famous fictional character. He was 63. Burroughs, who had been battling Parkinson's disease, died of heart failure a day after a fire at his home destroyed a room filled with family memorabilia. The cause of the fire is under investigation, said Alex Cornelius, a family spokesman. Bill Hillman, editor of Edgar Rice Burroughs-related websites, told The Times that "it was heartbreaking for Dan to put his life's work into preserving material for the family and see it go up in flames." The day he died, Danton Burroughs was to be named chairman of Edgar Rice Burroughs Inc., the company his grandfather formed in 1923 to merchandise his abundant fiction, which included dozens of novels and short stories. "My grandfather was always smart, taking care of trademarks and copyrights and going after infringers," Burroughs told The Times in 1990. In 1972, Burroughs became an officer and director of the family business, overseeing the company from a Mission-style bungalow on Ventura Boulevard that his grandfather built in 1927. The office is on the northern edge of 550 acres that Edgar Rice Burroughs named Tarzana Ranch in 1919. The community began going by the Tarzana name in the 1920s. 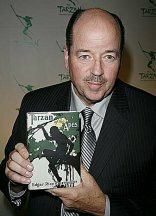 Profits from the creation of the fantasy character Tarzan of the Apes, which first appeared in a novel published in All-Story Magazine in 1911, allowed Edgar Rice Burroughs to purchase the land from the estate of Gen. Harrison Gray Otis, the second publisher of the Los Angeles Times. Decades after the author's death in 1950, revenue from Tarzan-related products continued to roll in as Danton Burroughs negotiated the sale of Tarzan rights for feature films, video games, comic books and such disparate products as stuffed animals, sleepwear, jackknives and multivitamins. He also carefully protected the source of the family fortune, suing anyone who used the Tarzan name or likeness without a license, according to a 1999 Times story. The business is "a multimillion-dollar corporation," Burroughs said in 1985 in The Times. "We don't tell anyone exactly how much money is involved. It's a privately held corporation, and we like to keep a low profile." Within the business, the gregarious Burroughs was especially valued as a historical archivist, said Jim Sullos, company president. "Dan had the most intimate knowledge of literature that his grandpa wrote," Sullos told The Times this week. "He could pull out of historical documents things people didn't even know existed." One of Danton's goals was to market some of Edgar Rice Burroughs' other works, especially the tales of John Carter, who stars in a series of novels that take place on Mars, Sullos said. Danton named his daughters Dejah and Llana Jane for two princesses his grandfather invented for his fictional Mars world; the Jane was for Danton's mother, Jane Ralston Burroughs. Burroughs was born June 21, 1944, in Los Angeles and grew up in Tarzana. In 1972, he earned a bachelor's degree in sociology from Cal State Northridge. His father, John Coleman Burroughs, was best known for illustrating the works of Edgar Rice Burroughs. He also was a photographer who documented Los Angeles as early as the 1920s. Many of his negatives burned in the April 30 fire at Danton's home, said Gerald Fecht, president of the Museum of the San Fernando Valley. A supporter of the Valley museum, Danton also helped found the Tarzana Museum and contributed many artifacts to its collection, which is housed in the Tarzana Community and Cultural Center. "I don't really expect to meet anyone like Danton again," Fecht said. "He had a sense of wonder, a sense of joy . . . he was absolutely a splendid person. When you were with him, it felt like vacation." An inveterate collector, Danton showcased his flea-market finds and other collectibles in his hillside home. Outside, his house resembled a mini-castle but inside it was more like a major antique store, friends said. Among his thousands of collectibles were jukeboxes and pinball machines, sheet music, street lamps and many literary works. In the fire, Danton lost treasured pocket watches and antique marbles but he was devastated by the loss of so much memorabilia related to his father and grandfather, Hillman said. "He felt, and rightfully so, that the Burroughs legacy was entrusted to his keeping," Hillman wrote in an online tribute. "And this disaster seemed to prove how vulnerable and fleeting such a legacy could be." He is survived by Linda, his wife of 28 years, and his daughters. Burroughs is also survived by a brother, John Ralston Burroughs, and a sister, Dian Burroughs. A service will be held at 2 p.m. Saturday at the Tarzana Community and Cultural Center, 19130 Ventura Blvd., Tarzana. Danton Burroughs, who oversaw the usage of his grandfather Edgar Rice Burroughs' Tarzan character, died May 1 in Tarzana, Calif. of heart failure. He had previously been diagnosed with Parkinson's Disease. He was 63. As chairman of Edgar Rice Burroughs, Inc., Burroughs handled licensing and promotion of properties such as Tarzan Lord of the Jungle and John Carter of Mars, including films, TV shows, comic strips, stage productions and books. Danton Burroughs was also a collector of art and literary works including sheet music and jukeboxes. Born in Los Angeles, he spent most of his life in Tarzana, the community his grandfather established and named after the famous character. He is survived by his wife Linda, two daughters, a brother and a sister. A memorial service will be held Saturday, May 17 at 2 p.m. at the Tarzana Community & Cultural Center, 19130 Ventura Blvd., Tarzana. Donations may be made to the Danton Burroughs Memorial Fund at Parkinson's Resource Organization, 74-090 El Paseo, Suite 102, Palm Desert, CA 92260. 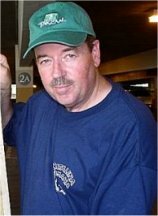 Danton Burroughs — the grandson of Edgar Rice Burroughs and a major force in keeping that man's work alive — died Wednesday evening or Thursday morning at the age of 64 from a heart attack. He had been suffering from Parkinson's Disease for some time but was also coping with an emotional upheaval. Earlier this week, a fire had destroyed a a large number of precious, historical artifacts in his collection. Danton was always fierce about the preservation of every possible book, photo or scrap of paper about his family members so one can only imagine the impact the fire had on his health. Danton died at his home in Tarzana, a suburb named for his grandfather's legendary creation. 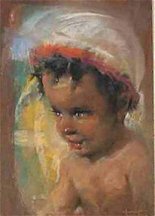 He was the son of John Coleman Burroughs, who was himself distinguished in the arts as a photographer, illustrator and author. One of the San Fernando Valley's greatest friends of history, Danton Burroughs has died. Dan died sometime after 10 last evening. He had struggled with Parkinson's Disease for sometime, but his death may have been related to a significant fire among his historical treasures on April 30th. Danton was the grandson of the beloved author Edgar Rice Burroughs, creator of Tarzan. Danton died at his home in Tarzana, a San Fernando Valley suburb named by his grandfather. Danton was the son of the great American photographer John Coleman Burroughs. 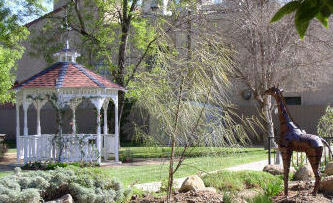 He was a founder of the Tarzana Museum and supporter of The Museum of the San Fernando Valley. Danton was a member of Chi Chi Chi Fraternity at Los Angeles Pierce College and was a lifelong friend of many members of the Beta Chapter of the Phi Delta Psi Fraternity. Danton was a member of Chi Chi Chi Fraternity at Los Angeles Pierce College and was a lifelong friend of many members of the Beta Chapter of the Phi Delta Psi Fraternity. Among the last persons to speak with him is Br. Jerry Berns who had a long conversation with Dan about 8 o'clock last evening. 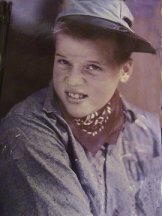 He commented to Jerry Fecht, the morning after the fire, that he cherished his college friends, who were the greatest of his treasures. At Dan's request, Jerry Fecht went to his home the morning after the fire to photograph damage. The photographs are a tragic record of how fragile our friendships and our history can be. Loose leafs from the New Yorker Books Department In 1919, Edgar Rice Burroughs, who created the character Tarzan of the Apes, bought a parcel of land in the San Fernando Valley from General Harrison Gray Otis, who was then the publisher of the Los Angeles Times. Burroughs moved there, naming his home Tarzana Ranch, and several years later subdivided some of his land to establish a writers’ and artists’ colony. The town boomed, soon petitioning for a post office and publishing a newspaper, while Burroughs’s empire—spawned by a single story about a man in the jungle—grew to be worth millions.
. . . Put this letter away and read it June 21st 1965. You will be of age then. See then if the politicians have kept your country great and strong. If they haven’t, do something about it. If I’m around I’ll remind you. . . . THE BURROUGHS LEGACY LIVES ON . . . Visions of Mars is a message from our world to future human inhabitants of Mars. It launched on its way to the Red Planet on August 4, 2007 aboard the spacecraft Phoenix. Along with personal messages from leading space visionaries of our time, Visions of Mars includes a priceless collection of Mars literature, and art, and a list of hundreds of thousands of names of space enthusiasts from around the world. The entire collection was encoded on an archival silica-glass mini-DVD provided by The Planetary Society, designed to last hundreds -- if not thousands -- of years. Edgar Rice Burroughs, of Tarzan fame, paid no attention to scientific considerations in his early 20th century Mars novels, which are also represented on the disk. Nevertheless, the immense popularity of his tales of high adventure taught millions to think of Mars as a place to go to, a possible setting for human action. His successors, Isaac Asimov, Ray Bradbury, Poul Anderson, and Arthur Clarke expanded on Wells' and Burroughs' images with scientifically informed and culturally sophisticated visions of a possible Martian future. They, and many others included in the disk, form a rich and nuanced tapestry of what the Red Planet has meant to humans at the end of the second millennium. Simply put, this modest looking disk is a digital record of our collective dream of Mars. 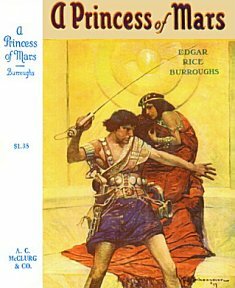 Including: Frank Schoonover ~ USA (1877-1972) ~ A Princess of Mars ~ 1917 ~ John Carter defends the Martian princess, Dejah Thoris, in this cover illustration for the classic novel by Edgar Rice Burroughs.